"The whipped cream topping can be made 4 hours ahead if chilled and covered. Can substitute Grand Marnier® for Chambord®, or use raspberry extract." Stir water, 5 tablespoons sugar, 1/4 cup raspberry-flavored liqueur, and lemon juice together in a saucepan over medium-low heat. Bring the mixture to a boil, reduce heat to low, and simmer, stirring frequently, until the sugar dissolves completely, about 8 minutes. Set aside to cool. 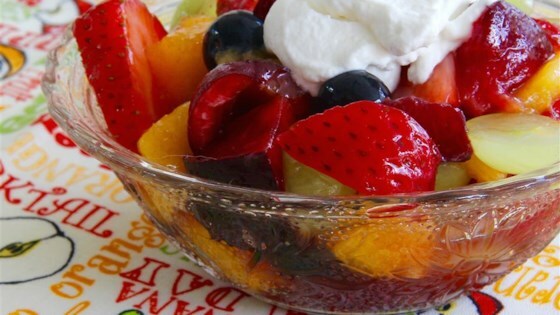 Mix nectarines, cherries, strawberries, raspberries, and blueberries in a large bowl. Pour the cooled sugar mixture over the fruit and toss gently to coat. Beat heavy whipping cream and 2 teaspoons sugar in a bowl with an electric hand mixer on high until stiff peaks form. Fold 1 teaspoon raspberry-flavored liqueur into the whipped cream; spoon over the fruit salad and sprinkle evenly with almonds.